It comes with a clean widescreen design, which is topped by a bright two color scheme. Its versatileness makes it perfect for any kind of web site creation, from business websites to photo blogs. Built on Warp7 and UIkit Capture provides full support for LESS. You can easily create your very own style with just a few clicks in the Customizer and change colors, spacing and fonts without having to write a single line of code. 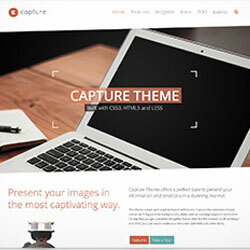 To get you started, Capture already provides 8 different style variations to choose from.